Mumbai: Hero Indian Super League (HISL) – India’s premier football league, set to kick off on 29th September 2018, has launched its national campaign titled #FanBannaPadega. The essence of the campaign puts football fans at the heart of the experience and their role in helping Indian football grow. With the upcoming season of the Hero Indian Super League, fans have the perfect opportunity to show their love for Indian and global footballing talent on display. Football globally, has never been about who wins and who loses, it is about the sense of belonging and the unconditional support and loyalty towards the sport. India is an emerging football loving nation, with loyalties divided at marquee global leagues/ tournaments, but Hero Indian Super League gives them the opportunity to come together to celebrate India’s footballing revolution. Thus, the campaign for the Hero Indian Super League Season 5 is a call out to all football fans at large to come together for Indian Football – #FanBannaPadega. Commenting on the launch of the Hero ISL Season 5 campaign a Star India spokesperson said, “The Hero ISL stands for the realisation of a dream, the dream for millions of Indians to experience and understand the essence of Indian football. Season 5 of the Hero Indian Super League is all set to usher in a new, refreshed wave of enthusiasm in India’s emerging appetite for football. 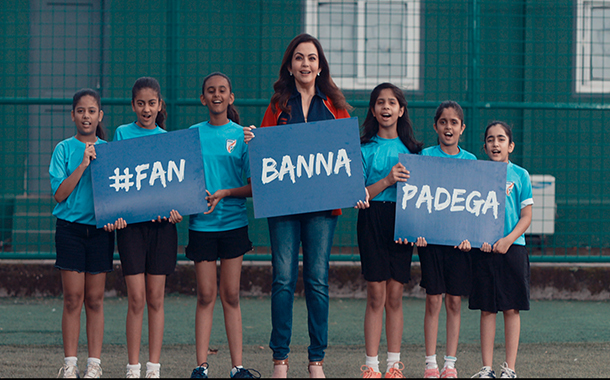 It is this essence that fuelled the introduction of the #FanBannaPadega campaign for Season 5 of the Hero Indian Super League, bringing football fans in the country together to support their heroes, their team, and their nation. The Indian Football journey has come a long way, a journey which began with the nation, in unison, singing “Lets Football” in 2014. The past four years has not only seen the Indian national football team enter the Top 100 in FIFA Men’s rankings but has also seen India hosting its first ever FIFA tournament (FIFA U-17 World Cup India 2017), Indian national team qualifying for the AFC Asian Cup 2019 and Indian U 16 and U 20 teams making the country proud with some strong performances during their exposure trips to Europe and other parts of the world. #FanBannaPadega will be supported by an extensive 360-degree execution plan that will be spread across the across the country through ATL/ BTL activities, TV, Print, Radio, OOH and social media. Following the national campaign roll out, there will be specific market campaign to build on the local club support. Season 5 will kick off in India’s football capital, Kolkata, with 2-time champion and home team ATK taking on Kerala Blasters FC (KBFC), whose love for football knows no boundaries, at the Vivekananda Yuba Bharati Krirangan in Kolkata at 7.30 pm. Hero Indian Super League Season 5 will be broadcast on the Star Sports network, Hotstar and Jio TV. Season 5 will have a six-language feed across 7 channels. Season 5 will also see the debut of Star Sports 3, wherein the Hero ISL will be exclusively broadcast in Hindi.